DEA has an internship program. I hope it will help build the next generation of reformers. Update: DEA has a press release about their recent retreat. Instititional investors are prohibited from selling a security they do not own, but some of them (mutual funds, FIIs) have fairly good flexibility on using single-stock futures where shorting is easy and convenient. Non-institutional investors - who make up the bulk of the market - are able to go short, but lack a mechanism for borrowing shares. Once again, shorting is easy and convenient using the single-stock futures. In addition, many day traders short-sell within the day but are forced to buy back within the same day since borrowing shares is infeasible. Reverse cash and carry arbitrage requires access to borrowed shares. Many securities lack individual stock futures. Obtaining market efficiency on these critically requires that speculators have a mechanism for selling borrowed shares. SEBI's announcement envisages short selling for the same stocks where individual stock futures are available. The impact there will, then, be limited to enabling the activities of arbitrageurs. While that is beneficial, much more remains to be done. The really important issue is the mechanism for borrowing shares. Will this work frictionlessly? In my intuition, demand for borrowing is small and the supply (with institutional investors) is quasi-infinite, so access to borrowed shares should become possible at very low prices. I wonder what the charges for borrowing securities are in the UK and the US. As emphasised in the MIFC report, the need of the hour is an integrated securities lending mechanism covering shares, corporate bonds and government bonds, so that short selling can flourish on all three markets. SEBI needs to urgently solve the problems of the borrowing mechanism, so as to then move forward on implementing this larger agenda. Short selling is more urgently needed on the bond market, where the minimum semblance of market efficiency is presently lacking. Economic liberalisation is, ultimately, about the idea that resource allocation driven by markets works better than that driven by a Planning Commission. This requires markets that work well. This calls for ample information disclosure, checks against market power, and a free play of both optimistic and pessimistic views. Short selling - expressing a negative view about a stock that one does not own - is thus an integral part of any well-functioning financial system. Sebi's recent moves on short selling are, hence, based on the correct vision for financial sector policy. When derivatives trading on individual stocks began, a "technology" for expressing speculative views about individual stocks became available. An optimist can buy futures or call options, or sell put options. A pessimist can sell futures or call options, or buy put options. Thus, with derivatives trading, a level playing field between positive and negative views is assured; short selling is no longer a big issue. 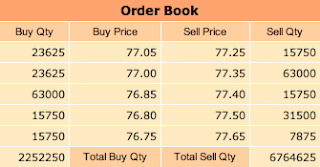 Unfortunately, Sebi says that short selling will only be available for these stocks. Sebi would do well to permit derivatives trading and short selling on more stocks. Short selling for stocks on the derivatives list matters only insofar as it supports reverse cash and carry arbitrage. When the futures price is `too low', arbitrageurs borrow shares, sell them, and buy the futures. The impact of this announcement will, then, be indirect: it will help cure the persistent underpricing of futures that has been found in India. Some features of Sebi's announcements are unfortunate. Institutional investors are prohibited from squaring off positions within the day. They are required to disclose that an order is a short sale at the time the order is placed. Retail investors are being asked to make the same disclosure at the end of day. Brokers have to supply this data to exchanges who will then release these to the public. These notions are not grounded in serious policy analysis. For the spot market, short selling is invisible: on T+2, when deliveries have to be made, the short seller supplies shares just like any other seller. A thorough policy analysis effort on Sebi's part would have led to the simple removal of all restrictions on short selling. The real challenge is not in short selling but in effecting borrowing of shares. Sebi proposes to set up an exchange-traded mechanism for borrowing shares. This involves one key rigidity that will hamper its success: borrowing and lending can be done only for seven days. This is inconsistent with the needs of futures arbitrage. When an arbitrage opportunity surfaces (say) three days from futures expiration, the futures arbitrageur needs a way to borrow shares immediately for a maturity of three days. While an exchange traded mechanism sounds sophisticated, the mainstream solution found internationally - that of merely borrowing securities OTC from institutional investors - appears to be a superior solution. Update: Andy Mukherjee disagrees, saying that India might well be onto something very important by emphasising an anonymous order-matching mechanism for borrowing shares. There was an announcement on 19th that the IFCI control transaction would not go through. The CMIE website shows this at 6:11 PM, so this would be after the market closed at 3:30. The stock price graph from Friday (14th) to Thursday (20th), from Yahoo Finance, is fascinating (click on it to see it more clearly). At the close of business on 17th, IFCI and Nifty were together. A gap showed up on 18th morning and widened slightly by 19th. 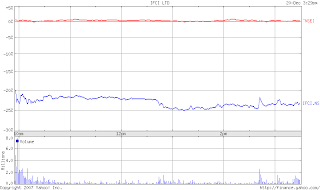 On 20th morning, there was a massive gap and the opening price was over 30% below that found on Friday. But then, IFCI is defunct. The only reason to buy IFCI is to get a license to be an Indian financial firm - a reflection of the entry barriers in Indian finance. 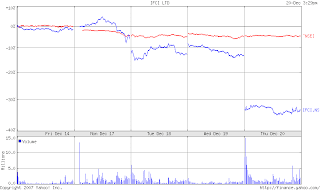 The 20th closing price (Rs.76.75) is still a hefty P/E of 7.89 and a P/B of 2.81. I often meet people who are repelled by sharp price fluctuations. Episodes like this are a vivid demonstration of markets in action, and of the importance of sharp movements of the price when there is a sharp change in the situation. The valuation of IFCI on Friday was conditional on the sense that a management transformation was around the corner. On Tuesday and Wednesday it was clear there were problems, and on Wednesday evening the announcement came out that the deal was not going through as envisaged. It is an efficient market that responds swiftly and clearly. Look closely at the intra-day chart for 20th (Thursday) only. I was fascinated to see how the opening price of Thursday morning was roughly true - there was no significant undershooting or overshooting. (Once again, click on the above graph to see it more clearly). There was a lot of turnover, but right in the first few minutes, the market basically got the closing price right. This IFCI story is a clean experiment because the firm is defunct; it has no expectations of cashflows that vibrate intra-day owing to news about the economy and the firm. The only news affecting the firm is the impending transaction (or lack thereof). 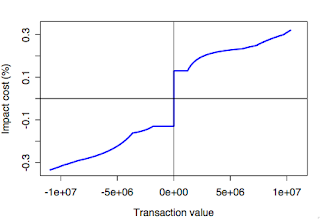 The LSS shows the impact cost associated with all possible transactions. Negative values on the x axis pertain to selling while positive values pertain to buying. It looks quite liquid. At the touch, the spread is ~ 0.26%. The one-way impact cost for buying Rs.5.6 million is 0.23% and the one-way impact cost for selling Rs.6.2 million is 0.26%. The `market-by-price' display (of the top five prices) alone gets you to buying/selling over Rs.10 million, where impact cost of a tad beyond 0.3% is seen. All in all, it's a good display of market resiliency - a big price move took place, but the futures market was not spooked, atleast by NSE closing time. On the subject of resilience, you might like to see this. To continue the discussion on the impact of rupee appreciation that was begun by Swaminathan Aiyar a few days ago, the software industry is an interesting test case of the questions of interest. This is because the domestic firms are primarily export oriented. Hence, firm financial data is directly relevant for understanding changing export conditions and their consequences. The software industry is expected to have been hurt both by the slowdown in the US, and by the appreciating rupee. While sales growth has dropped, margins have not yet dropped much. An operating profit margin of 28.46% is still a very large one by any standard - it is roughly ten percentage points bigger than the operating profit margin for non-financial firms as a whole. A glance at this table does not suggest that the INR/USD appreciation of 13.6% from Sep 2006 to Sep 2007 has greatly damaged the situation of these firms. In understanding what is going on, a key aspect is the role of the exchange rate appreciation as an equilibriating mechanism. With INR/USD at Rs.46 a dollar, the economy was overheating. The INR appreciation has helped deliver more normal conditions on the labour market, in the investment of firms, etc. As an example, see this excellent article by Mobis Philipose in Mint about the responses at Infosys. The appreciation is not a shock which is demanding corresponding adjustments of the economy; it is the mechanism through which the economy adjusts. A distorted exchange rate - like distorted petroleum product prices - yields distorted behaviour on the part of a lot of firms and households. When the government comes in the way of the market exchange rate, it hinders the adjustment process on the part of millions of households and firms. Hundreds of columns have been written on the exchange rate policy of the Reserve Bank of India, and its decision to let the rupee appreciate sharply this spring. However, what was earlier a debate mainly between technocrats has suddenly assumed populist, alarmist tones. In Parliament, commerce minister Kamal Nath has said the appreciating rupee has hit labour-intensive exports such as textiles, leather goods and gems & jewellery, and that one to two million workers may have lost their jobs. Following up, industrialist and Rajya Sabha member Rahul Bajaj has written in this newspaper suggesting that 2.8 million people have lost their jobs. The numbers are so huge that, if they were anywhere near the truth, we would have a major human tragedy on our hands. In fact, we have only tall stories and data inflation aimed at scaring people rather than informing them. I toured Gujarat in the run-up to the state election, and talked to a wide range of people about the many issues that might determine the outcome. Not a single person mentioned worker distress in export industries as an election issue. Nor did I see this mentioned in the innumerable TV discussions of the Gujarat elections. Now, at election time opposition parties are given to exaggerating rather than hiding distress issues. Narendra Modi was fighting principally on an economic development platform, and Congress speakers were looking desperately for flaws in his platform. Gujarat is a major centre for exporting both textiles and gems. If indeed workers were being thrown out of work by a strong rupee, this would have been a huge election issue. In fact, it was a non-issue. I myself toured Ahmedabad and Saurashtra. I can state categorically that the garment and textile areas there were not hit by mass unemployment. Indeed, at least one textile magnate, Vinod Arora of Aarvee Denims, was positively gung-ho about the future of his industry. I did not visit the diamond-cutting areas around Surat. But my Economic Times colleagues went there, and found no unemployment arising out of a strong rupee. They found signs of declining foreign orders, but this had not translated into fears of job losses among diamond cutters. The electoral impact was negligible. In which case the economic impact must be close to zero too. Proponents of a weak rupee are altogether more agitated than the people on whose behalf they claim to be agitating. Now, ET correspondents have reported job losses running into thousands in Tiruppur. Clearly, there is some distress in some areas. But it is not an all-India calamity. There is a world of difference between losing a few thousand jobs and two million. Some job losses are inevitable, indeed desirable, in a market economy, and constitute transitional pains, not human disaster. Those who claim that a strong rupee is costing millions of jobs are talking through their hats. We need to shout this from the rooftops, since many media folk are falling for false propaganda on this score. Indeed, the notion that modest changes in the exchange rate can produce such huge swings in employment is obviously false. If a modest rise in the rupee can kill two million jobs, a corresponding fall in the rupee should create a similar number of jobs. Alas, that did not happen when India had big currency declines in the past. Nor will it happen if the rupee now falls by 13%. Export growth in April-September was 26.9% in dollar terms, and provisional data suggest 35.6% growth in October. Even allowing for rupee appreciation of 13%, this constitutes solid export growth. Exporters may be under somewhat more pressure than before, but are not throwing millions out of work. A rupee appreciation is exactly like a reduction in all customs rates -- imported raw materials become cheaper and all tradeable finished goods become cheaper. I find it unsurprising that the advocates of autarky such as Rahul Bajaj, who fought for many years against lowering of customs duties, are similarly offended by rupee appreciation. I would also encourage two kinds of skepticism about job loss in India. First, the massive unorganised sector - where there is no labour law and the market clears - acts as a stabilising force when employment in the organised sector fluctuates. Through this, India actually has substantial flexibility in the labour market, unlike the situation in industrial countries other than the US and the UK. Second, with an overall workforce of roughly 500 million, fluctuations of 1 million or roughly 0.2% are lost in the imprecision of most statistical systems. So even though the word `million' sounds like a lot, on an Indian scale, it isn't. Swami also talks about the relative fluctuations of the rupee and the Chinese RMB. To help think about what's going on, here's a graph of the INR/CNY rate. 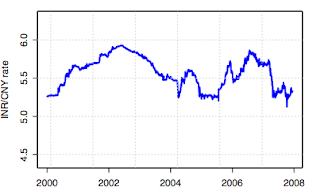 Think of it like the usual INR/USD graph - bigger values are a rupee depreciation, and vice versa. The broad picture that I get is of a little movement since 2000, and a lack of a time trend. Which is hardly surprising, considering that both countries essentially peg to the USD. T. N. Ninan has good news from the airport that's being constructed at Delhi. Right now, Delhi is probably the worst airport in the world (e.g. see a list of the world's worst airports in Foreign Policy). It will be an interesting contrast to see the existing mess being replaced by a new airport. The glass is half full on infrastructure, given the transformation of policies - politics - administration that has taken place with telecom, roads, ports and aviation. With electricity, railways and urban infrastructure, we continue to be mired in an unreconstructed and dysfunctional institutional framework. 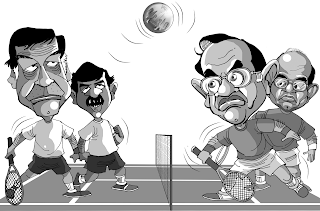 A few days ago, I had posted a blog entry pointing to my paper New issues in Indian macro policy which is forthcoming in T. N. Ninan's edited book. In that paper, I suggest that the glass is half full on fiscal consolidation. India has made important institutional changes (e.g. tied down fiscal policy with the FRBM Act) and administrative changes (e.g. the Tax Information Network) which have given significant progress on public finance. In connection with that, I noticed an RBI document which looks at state budget data for 2007-08. The press release summarises the important achievement: "The consolidated fiscal position of State Governments in 2007-08 indicates that the States have budgeted to achieve revenue surplus (0.3 per cent of GDP) during 2007-08 after a gap of two decades. As a consequence of the budgeted revenue surplus, the GFD is budgeted to decline to 2.3 per cent of GDP in 2007-08." The renowned academic Martha Nussbaum gave an interview in Tehelka magazine two weeks ago, in which she said: "This IIT mentality - become technically competent engineers, forget about human values - is very dangerous, particularly for a country like India." In response, Salil Tripathi wrote an interesting piece, which appears in Tehelka today. As Salil says, "No, I didn't go to the IIT, but some of my friends are IITans :-)". On 12th, SBI cut deposit rates by 25 bps. Many newspapers thought this was partly a response to the liquidity conditions that have shaped up after the rate cuts of the US Fed. When asked by reporters, Y. V. Reddy said that he does have monetary policy autonomy. An edit in Financial Express titled Rewrite the RBI Act interprets SBI's decisions as reflecting a loss of monetary policy autonomy in India. In the short term, the reforms to financial and monetary policy institutions that are required `to do the right thing' are not forthcoming. The present RBI leadership has repeatedly articulated a lack of interest in reform. In any case, even if there was an interest in reform, it would take time to do the institutional transformation of finance and monetary economics as described in the MIFC report. In the short term, the political situation is unfavourable for exchange rate flexibility, particularly given the difficulties that exporters will face selling into a slowing world economy. Hence, in the short term, we are stuck with a pegged exchange rate. 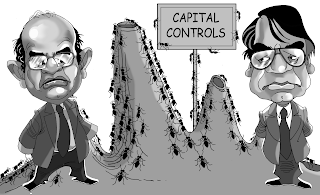 That leaves two choices: capital controls or loss of monetary policy autonomy. Capital controls are ineffective; India has gone too far along the route of modernising the external sector, and the political appetite for draconian controls (that are required in order to be effective) is absent. 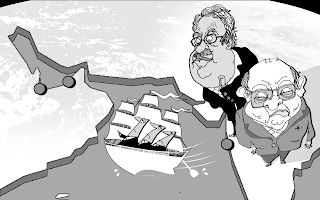 In addition, capital controls represent a step backwards compared with where India has to go. When financial firms and markets are damaged by controls, it will take time and effort to rebuild these things to get back to where we were. Hence, the best path forward in this trap that we are in is: To give up monetary policy autonomy, and cut rates. That might not be such a bad idea given the growing gloom in the global economy; lower interest rates would boost consumption and investment, and thus offset some of the impact of slowing exports [link]. Also see this review of the difficulties of India's pegged exchange rate regime in The Economist. I wrote an article in Business Standard today titled How frail are the firms? about changing currency volatility of a pegged exchange rate and its implications for the currency risk management of Indian firms.